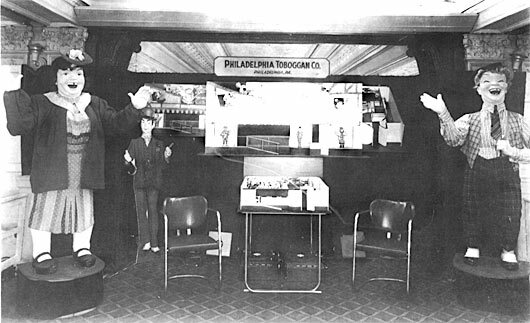 Three of the produced automatons, Laffing Sal, Sam, and Blackie the Barker, at a trade show display for Philadelphia Toboggan Company. The Philadelphia Toboggan Company Logo. 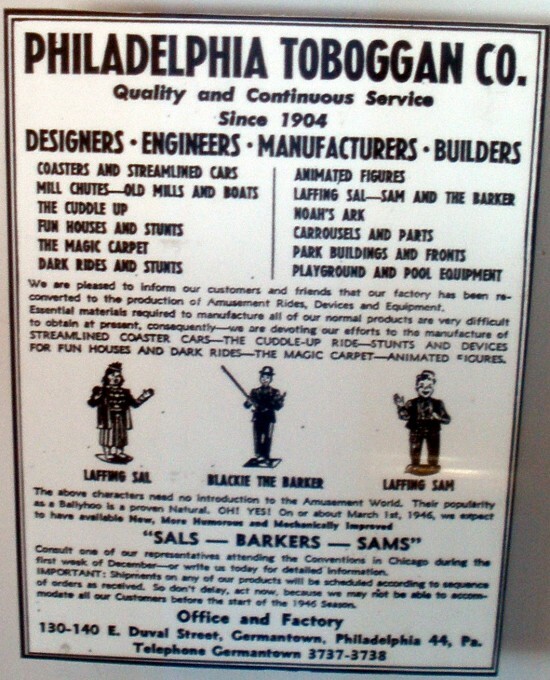 Philadelphia Toboggan Company was a company that specialized in the production of amusement park structures such as roller coasters, carousels, Skee Ball machines, and more. Among the list of attractions the company produced was a line of automatons, mechanized contraptions that were made to replicate the movements and actions of human beings. Little is known about these automatons, and what is known of them is met with many complications through many varying recollections as well as a vast rarity of existing models. After the production of their first and most popular model, Laffing Sal, this line of automatons became well-renowned attractions in the world of amusement and theme parks. A few of the models were made by Old King Cole Papier Mache Co. after being subcontracted by Philadelphia Toboggan Company. However, with the exception of Laffing Sal, all of these models have since disappeared widely from the public eye, losing both their former fame, as well as the audio tracks held within them. A model of Laffing Sal, the automaton that began Philadelphia Toboggan Company's automaton line. There are two stories circulating her audio track. In a 1994 interview with Dennis Atkinson, former Old King Cole general manager John Jackson stated that Sal's audio was sourced from a male radio talk show host who began to laugh while intoxicated after consuming Jack Daniel's whiskey. However, a legal case was once brought upon Philadelphia Toboggan Company by a woman who claimed to have voiced Sal. However, due to her inability to provide evidence, her case was dismissed. Laffing Sal's audio can be easily found through YouTube videos, her most popular locations being at the Beach Boardwalk in Santa Cruz as well as in the Musee Mecanique in San Francisco's Fisherman's Wharf. Laffing Sam was the first automaton produced following the massive success of Laffing Sal. Created to be Sal's husband, fewer models of him were produced compared to his female counterpart. Though there have been claims that Laffing Sam was showcased at Kennywood Amusement Park near Pittsburgh and made an appearance at the beginning of the 1982 short movie Arcade Attack - Silverball Heroes vs. Video Invaders, the only two confirmed locations of which Sam was displayed were at the Laff in the Dark exhibit as well as in Cleveland's Euclid Park, where he was unfortunately damaged during a fire. Records said to be produced for Laffing Sal and Sam. There are currently two theories regarding Sam's audio track. According to the 1994 interview, John Jackson stated that the audio tracks for Laffing Sal and Laffing Sam were the exact same with the only difference being a sentence regarding Christmas being stated by Sam every so often. However, due to Jackson's age at the time, it is hard to say as to whether or not his memories of the automaton are accurate. Bill Luca, the owner of the official Laff in the Dark website, claims that the audio found in 1970's Laffun Head "Crazy Vet" line of toys was sourced from a sped-up portion of the Old King Cole record track for Sam. However, Dan Koffman of Bibi Products which produced the Laffun Heads stated that the audio was provided by Ozen, a popular sound box company in the 1970's. Due to a missing connection between Old King Cole or Philadelphia Toboggan Company and Ozen however, this cannot be fully confirmed. It is also believed that the audio for Sam may have been provided by Messmore and Damon, a New York City-based amusement park renowned for their mechanical displays. Blackie the Barker, also known as Blackie the Sideshow Barker and 'Joe Barker' was the third most popular automaton in Philadelphia Toboggan Company's lineup. A model of Blackie the Barker used to sit with Sal and Sam at the entrance to the Laff in the Dark ride at The Pike but has since deteriorated. Not much is known about the model, and locations for the automaton aside from The Pike are virtually unknown. Laffing Luke and Giggling Gertie were two sitting automatons produced and distributed by Philadelphia Toboggan Company that were more often than not sold together as a pair. According to newspaper advertisements that Philadelphia Toboggan Company distributed, the automatons came with 20 records with a sale. It is currently unknown as to whether or not any of these records were shared with other models, and audio of any of the records has yet to surface. Laffing Farmer is an extremely obscure model of the automatons sold and produced by Philadelphia Toboggan Company. Online, there is only one image proving it's existence, and it is currently unknown as to where any models of the automaton would have resided.